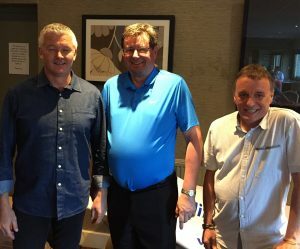 In a near two-hour chat, Bluebirds legend Jason Perry and BBC Wales’ soccer correspondent, Rob Phillips (pictured with Trust chair Keith Morgan) looked back at the Bluebirds’ promotion season and prospects for the new Premier League season. They were full of praise for work of manager Neil Warnock and his transformation of the club from relegation strugglers to promotion, describing it as an unbelievable achievement. Rob stressed that fans needed to be realistic about the new season. “It will be a question of ‘can they get results the way they play and can they cope with big defeats that will inevitably come?’ “You will have to get used to losing more,” he told Trust members. “The questions are ‘can they pull off a marquee win, can they beat those around them’? Teams will not want to concede throw-ins and corners against Cardiff City. Cardiff City may not be pretty but they impose themselves on you. Jason praised squad players like Matt Connolly and Anthony Pilkington, who often sat on the bench. They made an impact when they came on as Pilkington did scoring the equaliser away against Sheffield United while Connolly never let anyone down when called on. The strength of the squad would be key, he stressed.